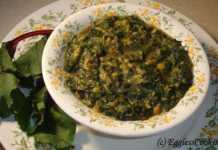 My grandmother used to prepare a sambar using methi (fenugreek leaves) leaves called “Pulla Keera” meaning tangy greens. It requires little more tamarind than the regular sambar and a tempering of mustard seeds, fenugreek (methi seeds) and green chillies which gives this side dish an unique flavor. Toor daal rice mixed with ghee, spicy potato roast and this sambar is simply a heavenly combination. I had a bunch of beets with the greens. So I decided to prepare the sambar using beet greens instead of methi. The beet leaves sambar tasted very good and comforting. Grandmothers’ recipes are always versatile and foolproof. Rinse thoroughly the greens and finely chop the beet leaves as well as the stems. In a pressure cooker cook the toor daal and keep it separately. In a saucepan add all the ingredients listed for sambar except the toor daal and keep it on the stove. The greens should be cooked completely. Add some more water if required. Now add the mashed toor daal to the greens and let it cook for another 3 minutes. In a small frying pan add the oil, once it heats add the mustard seeds. 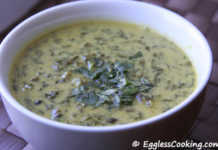 Once it starts to splutter add the methi seeds and the slit green chili and fry it for a minute. Add the tempering to the boiling sambar and leave it in the stove for another 2 minutes and then switch off the stove. This sambar should not have a very thick consistency also. It will taste better if it’s little watery. My family consumes very little tamarind, so 2 teaspoons is more than what we use regularly. So the important point is, use 1/4-1/2 teaspoon extra tamarind than you would use normally. The same goes with sambar powder and green chillies also. 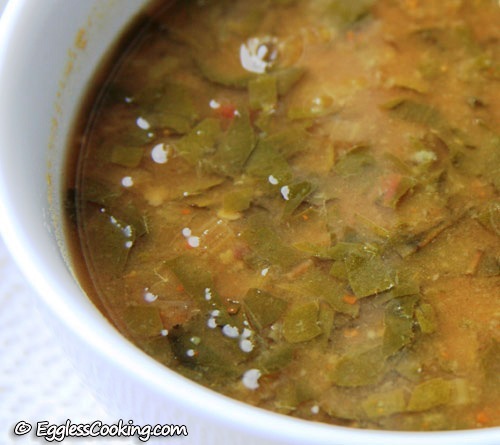 If you are used to spicy food, go ahead and increase it as well. I always cook with beet greens, but only as a dry curry. I have never used it in sambar and moar kootu. These sound great and I am going to try them. I love your site with all your innovations. Thanks Lalitha. I would love to hear from you after you try the recipes. I tried once but it got bitter, I have no clue why. Any idea??? No idea Cilantro. I have used beet greens a couple of times and it tasted good like any other greens. 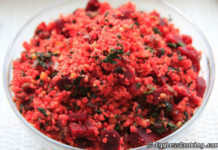 I have seen beet leaves in my store..But havent tried them yet..great recipe Madhu.. Yes, so true! Grandmothers’ recipes are always the best. 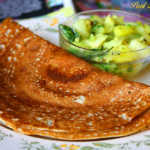 And this sambar looks so delicious and of course healthy. 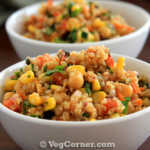 Thanks for sharing such a nice recipe Madhu! I have never bought beet greens but whenever I see a blog post on it I always feel I should try it. 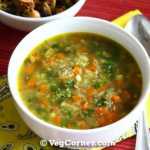 Thanks for sharing the recipe of this nutritious sambar. Very nice sambar, Madhuram. 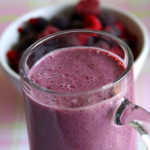 Beet greens have got to be among my most favorite greens, and its always great to come across new recipes. Hey Madhuram you always comes up with excellent recipes,This one is also great to see,and i always throw the beetleaves in to the trash,next time let me make use of it.